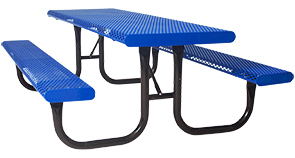 Expanded metal picnic tables with comfort rolled edges provides an ideal solution for commercial outdoor seating areas. The smooth, rounded edges enhances the user comfort and safety. Combine this unit with the matching site amenities for an inviting setting. These popular diamond pattern picnic table are built ready for lasting service. The frames are constructed with all-steel, MIG welded, 2-3/8"O.D. steel tubing reinforced with 1-1/6"O.D. braces. Available in 6', 8', Single and Double Overhang ADA table top and seat configurations. Tops and seats, ready for all-weather use, are all sealed with an ultra-resilient polyethylene finish. ADA compliant table is 8' and features a single or double sided 20-3/4" table overhang.